Generally, there is no end to the variants of Target Redemption Notes (tarns) or Target Forwards (tarfs) in the context of treasury FX hedging. Accumulators, Decumulators and Target Redemption Notes are again in high demand, especially in Asia. The first peak of popularity was reached in the mid of the first decade up to the financial crisis in 2008. Many investors were hit on the wrong side and turned away from these structured products. One of the problems was that currency hedging instruments had been used as “investment” products. The key reason why they are now coming back is that e-commerce platforms now include them and sales staff on the sell-side as well as clients on the buy-side can design them using a payoff-language and just hit buy- or sell-buttons, accompanied by straight-though-processed MiFiD documentation. Underlyings are typically currency, precious metals or equity markets. An entire private banking industry is again built around structured products, as trading is becoming more and more convenient. In fact, on the upcoming MathFinance conference 16-17 April, Peter Hahn (Commerzbank), who has been in FX trading and sales for over 30 years, will talk about electronic FX trading in 2018. Let’s take a look at what happened in 2008, when target redemption notes were mostly manually priced and individually handled. We consider an actual trade of an AUD-JPY knock-in-knock-out (KIKO) tarn between an American investment bank and an Indonesian HNWI on 27 June 2008, the summer before the Lehman bankruptcy. Normally, tarns are zero premium strategies at inception. Unusually, in this case, the investor receives an upfront premium of AUD 400,000. This FX tarn entitles and obliges the investor to purchase some amount of AUD and pay in JPY at the fixed rate of exchange of K=97.50 JPY per AUD, once a fortnight for fifty-two weeks. K is set below the market price prevailing at the trade date which was 101.99. A ‘knock-in level’ L is additionally defined, fixed at 89.50. The amount of AUD that the investor purchases each week is either 2,000,000 if the currency fixing is above K, or 4,000,000 if the fixing is below the knock-in. However, if the exchange rate is above B=103.40 (the ‘knock-out level’), then the strategy is terminated and no further purchases take place. The knock-out condition applies to all fifty-two weeks, and doesn’t affect past deliveries. An additional feature in the tarn is a cap on gains. For each purchase of AUD 2,000,000 (when the exchange rate is above K), the gain is realized immediately and paid in JPY. Should these gains exceed JPY 68,000,000 in aggregate, then the strategy is terminated and no further purchases take place. We outline the key features as follows. Risk for the investor: Exposed to higher volatility. If the exchange rate rises above the knockout, no further purchases happen and the profit to date is locked in, thereby limiting the profit potential. If the exchange rate falls below the knock-in, the size of weekly purchases doubles and at a rate that is then far above the market, i.e., underwater. Either of these conditions is a negative for the investor. Potential Gain: Maximum gain is JPY 68,000,000 or approximately AUD 657,640. Potential Loss: Maximum loss is theoretically AUD 104,000,000 in the event that the exchange rate falls to zero without ever rising above the knockout or triggering the cap on gains. Unlike equity, for a major currency pair this is not a feasible scenario. The all-time low of 55.00 would represent a loss of AUD 80,363,636. This is not far from the low of 57.12 for 2007-2008. Leverage: The ratio of options sold to options bought is 2. Margined: Like a futures contract, the KIKO tarn is traded on a margined account, which generally amplifies gains and losses, and reduces the ability of the investor to hold to maturity. Generally a KIKO TARN is a derivative investment on one underlying similar to an accumulator. The essential difference is that the profits are capped by a maximum amount called the target. The investor receives profits if the spot goes up, and makes a loss if the spot goes down. Cash flows are specified and occur usually on a sequence of currency fixing dates. Typically, fixings are chosen daily, weekly, fortnightly or monthly. The product terminates if either a knock-out barrier is reached or if the accumulated profit of the client reaches a pre-specified target. There are many different variations traded in the market. I would like to continue with our example of such an investment. The product started on June 27 2008 and ended on July 6 2009. Let K = 97.50 denote the strike, B = 103.40 the knock-out barrier and L = 89.50 the additional lower knock-in barrier. There are 26 fixing dates during this one-year contract in a fortnightly sequence, starting from July 11 2008. Let Si denote the fixing of the AUD-JPY exchange rate on date i. The client receives the amount REC = 2 × (Si −K) if Si ≥ K, 4 × Si if Si ≤ L, and zero otherwise, and pays the amount PAY = 4 × K if Si B L, and zero otherwise, in Million of JPY. The corresponding P&L in JPY is illustrated in Figure 1. 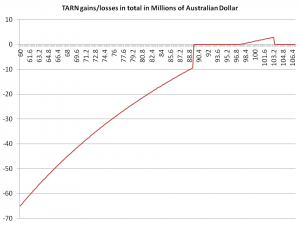 Figure 1: Illustration of profits and losses in a long KIKO TARN (Target Redemption Range Accrual Note). A range of possible AUD-JPY fixings is plotted on the x-axis. The y-axis denotes the profit and loss per fixing in million of JPY. The fortnightly payments terminate automatically, if a currency fixing is at or above B, or if the accumulated profit reaches the target of 68 M JPY. The accumulated profit is the sum of the fortnightly profits PROFIT = 2 × max(Si −K, 0) in million of JPY. The best case each fortnight happens, when the spot is just before the barrier B, which would be MAXPROFIT = 2 × max(B −K, 0) = 2 × max(103.40 − 97.50, 0) = 2 × max(5.90, 0) = 2 × 5.90 = 11.8 M JPY. 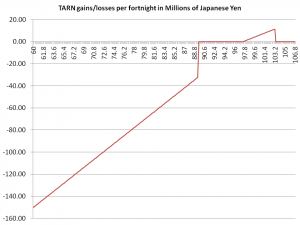 If there was no target, then the maximum profit for all the 26 fortnights would be 11.8 × 26=306.8 M JPY. However, because of the target the total profit is limited to 68 M JPY. Figures 1 and 2 show clearly the limited upside potential and the unlimited downside. For example, should the AUD-JPY spot go down to 80.00, the investor would make a loss of 70 M JPY or equivalently 875,000 AUD each fortnight. In this case the total loss would be AUD 875,000 × 26 = AUD 22,750,000.The worst case happens on the downside, where the investor is getting long 26 × AUD 4,000,000 vs. JPY at a rate of 97.50, which will happen if all 26 fixings occur below 89.50. Although the nominal “notional” is AUD 2,000,000, this TARN can potentially create an FX position of AUD 104,000,000 at 97.50, and thus its delta, or exposure, would be of the same order of magnitude, if the spot rate falls early on towards 89.50. Note that the lowest exchange rate ever observed to date was 55; the lowest of the move in 2008 was 57. Compared to Figure 1, Figure 2 illustrates how the gains and losses accumulate through time taking all 26 fixings into account and assuming that the TARN does not terminate early. The limited gains as opposed to the unlimited losses are clearly observable. Figure 2 : Illustration of profits and losses in a long KIKO TARN (Target Redemption Range Accrual Note). A range of possible AUD-JPY fixings is plotted on the x-axis. The y-axis denotes the profit and loss in AUD summed over all 26 fixing. The nature of the trade is that the investor hopes that the spot rises and leads to an early knock-out either by reaching the target profit or by hitting the barrier B. Finally, I would like to point out that although usually tarns trade at zero-cost at inception (i.e. none of the buyer or seller pays anything), the one considered here generated an upfront payment of 400,000 AUD from the bank to the client. Typically an upfront premium of a normally zero-cost structure is used in the market to cover losses encountered by other investments: as a method to ‘restructure’ a position, a client receives a premium for a new structured investment that is used to unwind an old investment that has gone under water. More on structured products are contained in the second Edition of FX Options and Structured Products, which will be available on the MathFinance Conference. Markets are up for a second round of structured products in private banking, now on electronic trading platforms. The new MiFiD rules now provide a security layer for banks, protecting them from being sued. The show must go on. Es gibt noch viel Platz für neue Denkansätze und unkonventionelle Ideen bei d-fine. Registrieren Sie sich auf unserer Homepage bis zum 1. Mai 2018. Je früher, desto besser, denn die Teilnehmerzahl ist begrenzt. Wenn Sie also gerade dabei sind, Ihre akademische Karriere mit einem exzellenten Abschluss (BSc, MSc, Diplom oder Promotion) zu krönen und bereit sind, einen Schritt über die Grenzen zwischen akademischer Theorie und Unternehmenspraxis zu gehen, dann sind wir gespannt auf Sie.